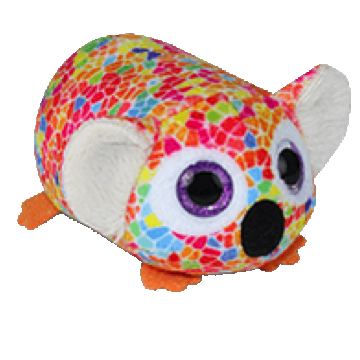 Kaleb is a tiny koala covered in a multi-coloured patch pattern. He has purple glittery button eyes and a black, oval-shaped nose. His tiny feet are bright orange. Kaleb has fuzzy white material inside his large ears. The three variations of Kaleb are this purple eyes version, a green eyes version, and a blue eyes version.